Every single story matters. The more we deny them to ourselves and the world, the more pain we endure and co-create. What if you could “get your brave on,”offer your story of courage with the world and find yourself supported by others sharing their stories, too?? Imagine people just like YOU around the globe each facing a fear and then sharing it to not only step in their courage to but to inspire others to do the same. In losing a dear friend to breast cancer and discovering that I was alive and breathing but I was NOT really living I finally understood WHY I was playing small, staying safe and not living full out… it was because of a nasty four-letter word, FEAR! In her honour I wrote MY FEAR LIST and began saying YES to fear instead of hiding or running from it. Now, when I decide to do something, I tend to go all in. So I started with one of my greatest fears; jumping out of a perfectly good airplane.… But, here’s the thing, I knew the only way I would be able to lean into fear and actually jump was if I made it not just about ME but found something bigger than me to believe in and strive for which actually turned my fear into fuel. I decided to fall 10,000 feet to raise $10,000 to build a school in Nicaragua. And THAT why was exactly what I needed to get MY brave on. Okay, so that was a little bit extreme. Not everybody is going to jump out of a plane as the “opening move” to their courage campaign. But we can all start with whatever courageous step feels right to us. I want you to know that when you say YES to your courage you will be making a big difference not only in your life but in the world. 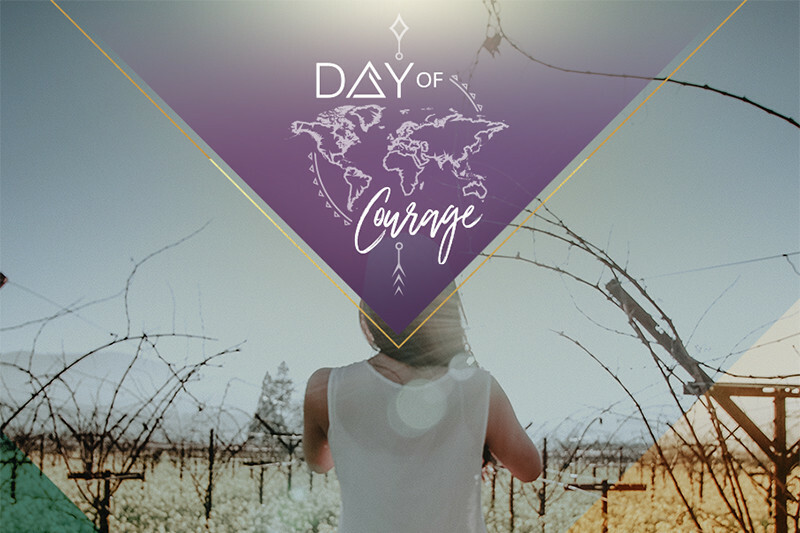 Your story of courage will inspire others to find their courage and imagine the ripple effect of courage around the world if we spread this movement and get people facing fears on every continent! This isn’t about you being courageous alone, this is about us, a global movement of Courage Crusaders, rising up, taking steps, supporting each other and sharing our stories. You need it. I need it. And, honestly, right now, the world needs it more than ever! So are you IN… Let’s do this… On August 28, 2017, join people around the world as we all get our BRAVE ON for our Day of Courage! Give $1 (or more) to charity with a collective force uniting for massive change! SHOW UP and help build 8 homes in Nicaragua for a Women's Collective there in desparate need, support I Am Genie in granting wishes for those diagnosed with a terminal illness and build wells in Africa the more money is pledged the more we can give so if we raise more we will also build schools in India and Tanzania, and give loans for women in 3rd world countries to start businesses. Now that’s turning COLLECTIVE COURAGE into GLOBAL POWER and IMPACT! THIS is a big WHY that will help you say HECK YEAH to your FEAR! $1 Million Dollars Raised for Charities! So are you ready to get your brave on and join us for a Day of Courage?